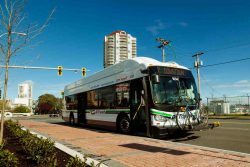 BC Transit continues to add compressed natural gas (CNG) buses to its fleet across the province as part of its commitment to reducing greenhouse gas emissions. BC Transit will be welcoming its first 30-foot medium duty CNG buses to its fleet over the next two years. “These new CNG-powered buses will help meet growing demand, support better daily transit services for users, and help protect the environment by supporting cleaner energy systems,” said the Honourable François-Philippe Champagne, Minister of Infrastructure and Communities. Apart from the 30-foot medium duty CNG buses, new heavy duty buses have been added to BC Transit fleets across the province, and more are on the way. Whistler welcomed four new buses, while fleets in Nanaimo and Kamloops have each added two.